There are many precision tasks that need to be carried out during the installation of any LOFAR station. 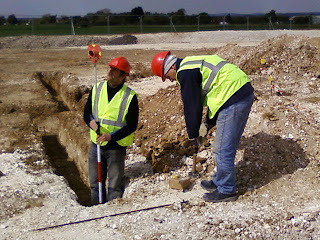 But perhaps the one that most characterises it is that of the ground survey. Each mark or reference point (ie. where each of the 96 antennas in the LBA and HBA go) needs to be carefully calculated to accomplish the astronomical aims of the telescope and to optimise the performance. These coordinates are then transformed through different reference frames to finally arrive at a list of local geographical references. 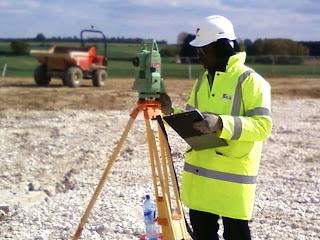 From there, the surveyor can mark out the field to centimetre precision. In this first picture, Bale Granville sets the theodolite for the free station position surveying of the LBA. Here, technicians Tom and Justin from the University of Southampton assist the site surveyor by positioning the target and hammering in the survey pegs after the measurements have been completed.